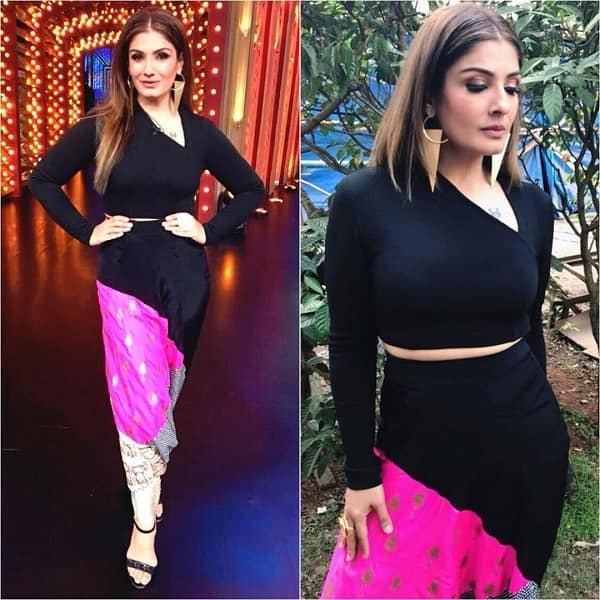 Raveena visited the sets of Entertainment Ki Raat and she wore a Masaba top and patchwork drop crotch pants. While we don’t have any complaints from the top, the pants just don’t work, especially those cuffs at the ankle. Wish she would have not experimented too much. Because it clearly failed. Surveen was one of the attendees at the GQ Style Awards. She posed at the red carpet wearing a strapless sequin gown from Garimon Roferos Couture. She picked wraparound Gianvito Rossi sandals and curled her hair to finish her look. The only and the major problem with this look is those two side slits, and the pose in some pics is just way too awkward. Wish the gown just had the one thigh high-split. Huma too attended the same awards function and she was seen a black gown by Gaurav Gupta, which had featuring two pink crinkled floral accents. She might have thought to go brave, and we commend for that, but honestly it didn’t work. More so because of the makeup, which didn’t compliment the gown at all. Disha stepped out in Mumbai recently wearing a ruched top with a denim mini skirt. A Chanel bag and pair of Puma slides were the accessories she chose. You know, we appreciated her last week for wearing some lovely outfits as she was promoting her recent film, Baaghi 2, but this was a disaster. We kind of like the skirt, but that top, no way! The GQ Style Awards had quite some misses. Sapna Pabbi was another celebrity, who made us go WTF. From the hairdo to the makeup and of course the outfit, nothing worked for us. Come on, she wore a T-shirt and wore a sequins dress on top of that. The makeup looks extra shiny, atleast in the photos. Don’t see a point of wearing that blue belt there. Could have been any other colour.